Born in Rome, Sgambati made a successful career as pianist, conductor and composer. At various times he received the support of both Liszt and Wagner. Liszt took Sgambati as a pupil and later entrusted him with the Italian premiere of his Dante Symphony - and, non-musically, observed that Sgambati’s eyes were “as beautiful as the King of Bavaria’s”! Wagner was very favourably impressed by the Italian’s two piano quintets - which were published by Schott, at Wagner’s encouragement. He was praised by both Brahms and Busoni. As a pianist, Sgambati did much to introduce the works of the nineteenth-century German piano school to Roman audiences. He toured as a pianist in northern Europe. Historically he is a figure of real importance in the history of Italian music, fundamental to the renaissance of instrumental music in the late nineteenth century Italy. Casella, indeed, declared him to mark “the beginning of the renaissance in [Italy] of instrumental music, which had been in abeyance there for a whole century”. Historical importance – which Sgambati, as both performer and composer, undoubtedly has – is one thing. It is another to ask how well the actual music now sounds. In general, the answer is that at times it is quite striking, at times relatively routine and derivative. Certainly most ears will hear echoes of, say, Liszt and Schumann, of Chopin and Mendelssohn … of all the usual suspects, in other words. But very often these influences are synthesised in a fashion that produces music which none of Sgambati’s musical progenitors would have written. 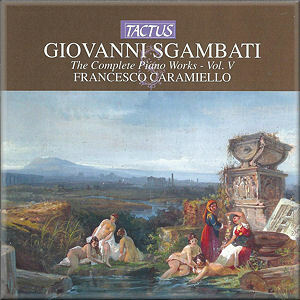 In truth, this fifth volume of Francesco Caramiello’s complete recording of Sgambati’s compositions for piano wouldn’t be the best place to begin a serious reassessment of this body of work. Caramiello’s playing is committed, idiomatic and sensitive – as it is on the earlier volumes in the series which I have heard. But for the most part this is a gathering together of pieces which are generally rather short, often left unpublished amongst the composer’s papers or written for the use of his students. In most of these works one doesn’t hear Sgambati at his best, though most of them have at least some pleasures to offer the listener, however minor they may be. In a few places – such as Mestizia or the Valz brillante one hears Sgambati working at something like full intensity and in them his Italian late-romantic take on German romanticism is genuinely striking. Also of real interest are the Trois morceaux for four hands, written in 1886 - unpublished and left untitled in Sgambati’s papers - in which one hears the composer breaking out of the conventions within which he largely worked, and coming up with some distinctly unexpected melodic turns and harmonic resolutions. Sgambati’s work has an aesthetic interest which makes it of more than merely historical interest and in Francesco Caramiello he has found an excellent latter-day advocate.